Greenpeace Energy presented a new study in August of 2015 according to which “wind gas” (gas produced with the help of excess power from renewable energy – hydrogen or methane) could contribute to strengthening the transformation of the energy sector. 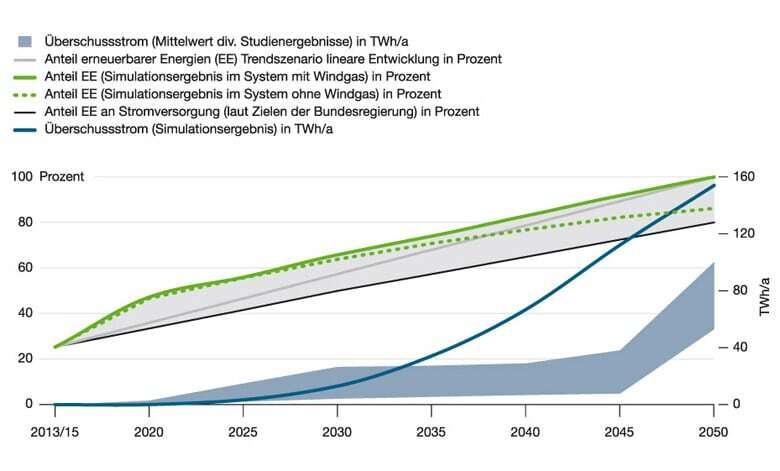 The 97-page comparison of future power supply with and without Power-to-Gas technology concluded that “from 2035 on, electricity supply would be cheaper with the help of wind gas technology than without it.” Furthermore, “with the help of wind gas, it would be possible to have the entire power supply generated by renewable sources by 2050, instead of the 80% aim of the government – and at considerably lower costs.” Without wind gas systems, there would be no electricity supply exclusively from renewable sources, no matter how many solar, wind or biogas systems were added (see picture). The study commissioned by Greenpeace Energy was conducted by the Research Center for Power Grids and Energy Storage of the OTH Regensburg and Energy Brainpool. The energy cooperative was founded in 1999 by Greenpeace Germany and has since worked based on the environmental organization’s ecological standards.